I love small celebrations and get-togethers and Easter is no exception. This year however I won't be hosting the Easter brunch, I hope my family can forgive me ;-), it's a just too much for me to handle right now being 6 months pregnant and very busy with preparations for baby. So Abbas and I will keep it simple and sweet with a tête-à-tête brunch instead. Let's talk table style & decor. To be honest I'm not a huge fan of a very colorful easter nor do I tend to fall for those very bright almost fluorescent yellow, green or pink fluffy bunnies as far as decor goes. I don't feel it works well with our serene and neutral interior. I do love some pops of color, mostly pastels around the house. 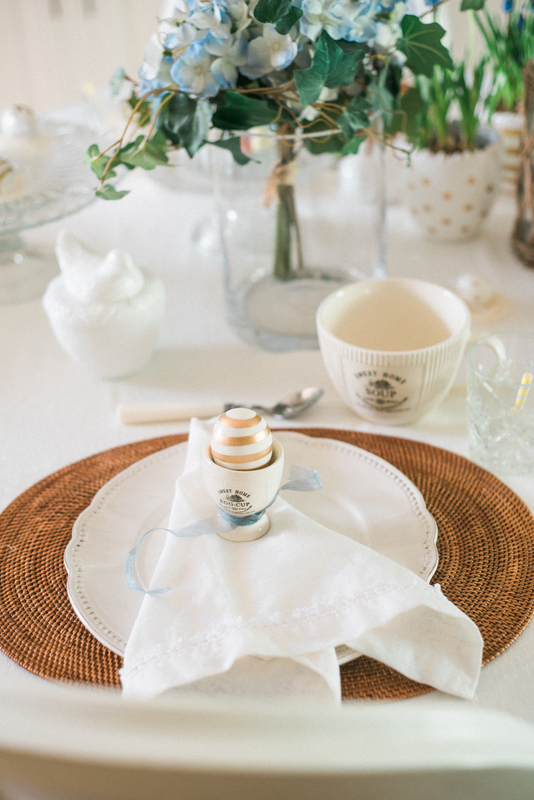 This easter I went for a ton-sur-ton look with creamy white linen tableware, creamy white porcelain, glass cake stands, organic touches such as the place mats and the little egg nests and beautiful spring florals. The potted flowers and the bouquet make for a lovely centerpiece. Who else is so happy to see local flower shops filling up with spring flowers? I love the muscari (grape hyacinth) with its pretty flower buds (in just the right shade of blue) and the classic (dusty blue) hydrangea. Hydrangea's are one of my all-time favorite flowers! I must admit, the hydrangea bouquet I used for the table is made from silk flowers, which I'm not a fan of in general but I do love this particular bouquet because it looks really natural. Inside a glass bell, small wooden easter eggs add a little touch of playfulness and color to my table styling. I love that they were dipped into color paint. The table still needed something more so I added some small accents: the little nests with creamy white & golden colored eggs and dusty blue ribbons around the egg cups. So what shall we make & bake? Honey, right off the top of head.. how do you feel about freshly squeezed juice, café and French toast, alcohol-free sparkly, yoghurt with fresh fruits, scrambled eggs and smoked salmon (damn it, no smoked salmon for me..gotta think of the baby) and lamb chops with herby oven potatoes? Tell me, I'm curious to hear about your family traditions. How do you celebrate Easter? How do you style your home for the Easter Holidays? Or are you going on a trip and will you celebrate abroad?